TUNE-IN ALERT! I’m Being Interviewed on Los Angeles Local News on Thursday, But You Can Watch From Anywhere! | Keep It Up, David! This is an exciting week! I’ve been invited to appear on KTLA Morning News this Thursday! Here’s how you can watch, no matter where you are! It’s the only local news broadcast that competes with the big guys: Today, Good Morning America, and CBS This Morning, and, in Los Angeles, it’s more popular than all those shows. Angelenos love KTLA Morning News! On Thursday, June 7, at 8:25am*, I will be a guest on KTLA Morning News, discussing weight loss, fitness, stair climbing, and introducing viewers to a super cool piece of fitness equipment. *While I’m currently scheduled to be interviewed at 8:25am, you should allow some wiggle room, because sometimes things shift at the last minute if it’s a big news day. How do you watch? EASY! If you’re in the Los Angeles area: Tune in to KTLA (Channel 5) at 8:25am on Thursday, June 7. If you’re anywhere else: Watch live on their website! Go to KTLA.com on Thursday morning, and click on the “Watch Now” button in the upper left corner. You’ll have to watch a short ad first, but then you’ll be watching a live-stream of the broadcast. Oh, and keep time zones in mind. East-coasters, for example, should tune in at 11:25am. Will the interview be online after the fact, for everyone that can’t tune in live? I don’t know yet, but I’ll definitely share the links if it is! Send good vibes my way on Thursday. It’s live, so hopefully I won’t trip and fall, curse, or otherwise embarrass myself. 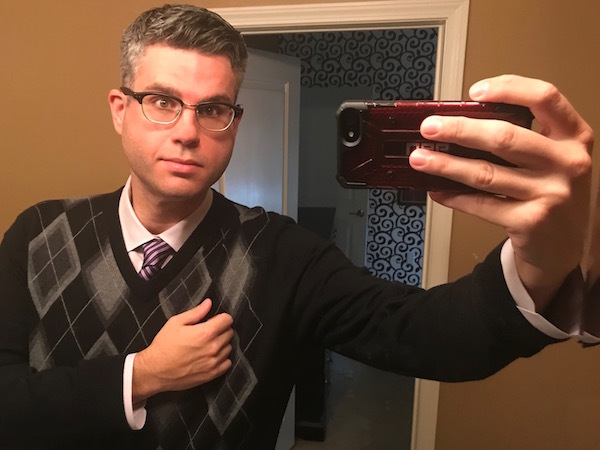 Or maybe I will, and it will go viral online, and I’ll be as famous as Tay Zonday, the “cash me outside” girl, or Grumpy Cat. In other news, I’ll have another interview to share soon. I recently spoke with weight loss vlogger Kathy Miles, and she’s going to post the video on her YouTube channel later in the week. More details to come, but you can check out Kathy here. She’s lost 178 pounds so far and is very open, candid, and honest about the process. Lastly, there are primary elections in California and seven other states today, so GO VOTE! 37 states have elections between now and September, to determine the ballots for the big mid-term elections in November. 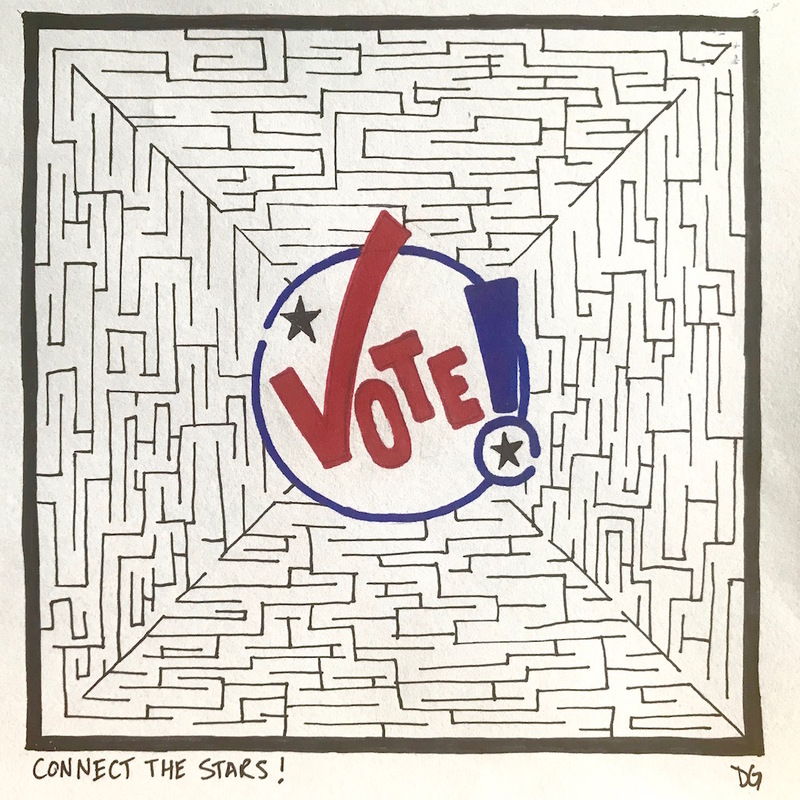 I drew a maze to encourage folks to join me in making their voices heard. Click on it to see it bigger! Check out dozens more of my mazes at uncledavidsmazes.etsy.com! And don’t forget to watch me on TV! This entry was posted on Tuesday, June 5th, 2018 at 12:33 am and is filed under Uncategorized. You can follow any responses to this entry through the RSS 2.0 feed. You can leave a response, or trackback from your own site. One Response to TUNE-IN ALERT! I’m Being Interviewed on Los Angeles Local News on Thursday, But You Can Watch From Anywhere! Love the KTLA morning news! I’ve got my DVR set!